There are 21 items in this list, view them all as images ? Hand made in India. 7 top strings, 11 sympathetics. Student quality. 87 cm hollow Paulownia body, 13 string, with tuning tool, picks and gig bag. Made in Japan - Modern Sanshin - Similar to Shamisen sonically but slightly different construction. Snakeskin! This is a very high quality example of a classic Okinawan instrument. Made in Japan, Typewriter style keys, with case. 16 String Autoharp, 4 chord, unique and charming vintage, needs strings. With manual and beater. Hand made in China. Snakeskin sound skin. Rosewood. Includes hard foam case, bow, rosin. Made in Japan - Modern Sanshin - Similar to Shamisen sonically but slightly different construction. Snakeskin! This is a very high quality example of a classic Okinawan instrument. 5 string Auto Harp. Made in Japan. 4 String Chinese lute/guitar. Hand made in Hebei Province in China. Includes compressed foam case. Brand New! Made in China, Chinese lute with 4 strings and 30 frets. includes gig bag. Brand New! Made in Japan - Modern Sanshin - Similar to Shamisen sonically but slightly different construction. Top and Bottom Doumaki covering. 55cm ~ Scale. Comes with bag. 1980's Made in Japan. Auto Harp. 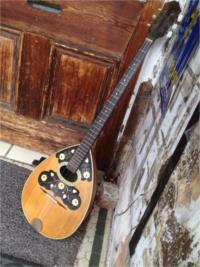 Circa ~ 1960's Made in Greece - Very Well Made Traditional Three String/Course (D.A.D) Bouzouki (the Outlaws Bouzouki!) 21 Ribs. Recently Set Up by Paul Dalby. Tuned in the Key of D. Hand Crafted in India. Droning Reed Instrument Box! Wheel 4 - B, G and A. Each wheel can also be silenced. Enter your email address below to get alerts for World music.